Today is Fat Tuesday! Oh yes, that wonderful day where everyone can pig out and have a reason to. If you have not experienced Mardi Gras….. fear not… you can. Simple as some beads, masks, good creole music, and some gumbo. Lots of recipes out there, but hey if you are interested in making this dish….. send me a message and I will send you the recipe. KGOS/KERM radio and the EWC Lancer Rodeo team invite business owners and vendors to participate in the Second Annual Trade Show held in conjunction with the 2018 Lancer Rodeo. The Trade Show will be held March 23, 24 and 25, 2018. Trade show booth space rental includes 3 days rental of a 12’ x 6’ or a 12’ x 12’ space, 1 eight foot table and two chairs. The vendor will also receive name recognition during the Lancer Rodeo performances, live on-air interview during the trade show with KGOS/KERM and have their name listed in the EWC Rodeo program. The rental fee for the three day event is $150 for 12’ x 6’ or $300 for 12’x12’. The EWC Lancer Rodeo was named the 2016 Rodeo of the Year and over 290 contestants competed. Attendance at the rodeo usually exceeds 4500 with family, friends and spectators traveling from over 10 states. To reserve a spot for your business please contact Clark at 307.532.0692 or Kath at 307.532.2158. Eastern Wyoming College President, Dr. Lesley Travers, has announced a Community Roundtable which will be held on Thursday, February 8th, from 12 – 1 pm in the CTEC conference room. Business, industry and community members or any person who is interested is invited to attend the open Community Roundtable. “Elements for communities to thrive or decline in the 21st century will depend upon how well we cultivate and retain a robust workforce. These individuals will possess post-secondary educational credentials and technical skills that will be entrepreneurial in nature in their work with the ability to learn rapidly. For this to occur, education at the community college level needs to be closely aligned with workforce and economic development efforts. We need to know what our business and industry partners need from our students.” In this round table, I would like to encourage anyone in business and industry to join me to discuss their current and/or future needs. How can EWC provide support and assistance to our business partners?” said Dr. Travers. Dr. Travers will provide any information of interest about the college, will answer any questions and address any concerns. She will host a Community Roundtable each month. Attendees are invited to bring their own brown bag lunch if they would like. Eastern Wyoming College President, Dr. Lesley Travers, is pleased to announce the appointment of Mr. Roger Humphrey to the position of Vice President for Academic Services. Mr. Humphrey had been serving as Interim Vice President since July of 2017 and was appointed to the position at the December, 2017 Board of Trustees meeting. “Mr. Humphrey has added some depth to our academic team and is well-respected by faculty, staff and administration at EWC. His ability to communicate and understand our needs academically have been extremely helpful to me as a new president. Roger is very knowledgeable and dedicated to EWC,“ said President Travers. Humphrey joined EWC in 2015 as an Education Instructor. He then became the Associate Vice President for Academic Services and Outreach with the retirement of Mike Durfee. Roger has spent the past 34 years in various positions in the public school systems, serving as a classroom teacher, building principal and central office administrator. Roger served as the Assistant Superintendent for curriculum, assessment and professional development with Campbell County School District in Gillette. Mr. Humphrey has also served as the Director of Title I in Gillette, Assistant Superintendent in Goshen County, Elementary Principal at Baggs Elementary in Cheyenne and Elementary Principal in Pine Bluffs. 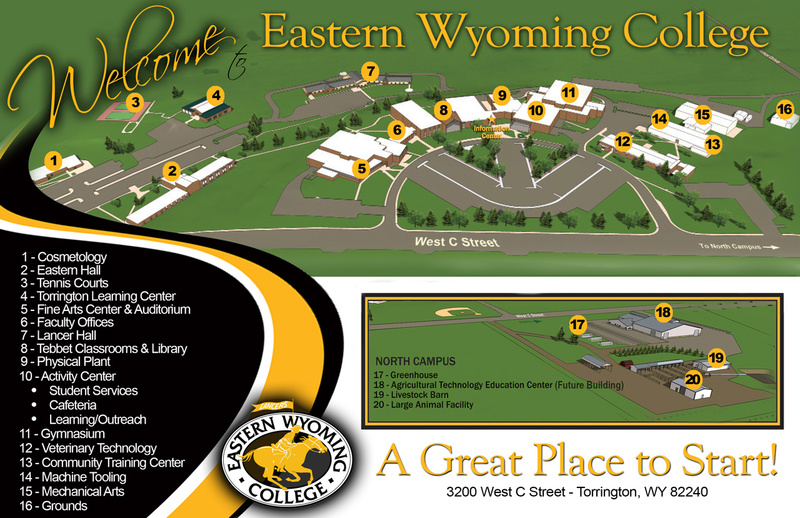 “I am excited to continue to work with administration, faculty, and staff here at Eastern Wyoming College. We will continue to work collaboratively to enhance and expand curricular offerings and programs for the students at Eastern Wyoming College,” Vice President for Academic Services, Roger Humphrey said. At the annual Sagebrush and Roses held recently, over 350 people attended and raised $15,000 to support the EWC Ag program. Sagebrush and Roses is a team effort and hard work by the Sagebrush and Roses committee: Kaitlyn Steben, Holly Lara, Lynnea Bartlett, Rick Vonburg, Susan Stephenson, Leann Mattis, Georgia Younglove, Debbie Ochsner, Tami Afdahl, and John Hansen. Suzey and Stephen Delger donated the funds for a Benelli 12 gauge pump shotgun and requested that it be purchased locally from Gary’s Gun Shop. Suzey is the Director of the EWC Nursing program in Douglas. Those assisting in selling tickets for the shotgun at the event were Suzey and Stephen Delger, Dr. Travers, Todd Peterson, and John Hansen. The winner of the shotgun raffle was Jeff Marsh and after Mr. McNamee, offered the final four ticket holders the opportunity at a 50 /50 live auction, an additional $635 was raised. Tim Nichols (UW President Laurie Nichols husband, donated back his proceeds from the 50/50 live auction) and the total amount raised was $2715. A quilt, which was expertly crafted by Dr. Lesley Travers raised an additional $1,100. “Sagebrush and Roses brings out the best in us as a College and will help grow scholarships and support our efforts in completing the Agricultural Technology Education Center,” said John Hansen, Director of Institutional Development. “As I reflect on the 2018 Sagebrush and Roses, I am in awe of the generosity of our community. It is inspiring to see 350 guests having such a great time all while supporting the EWC Agriculture Department and Livestock Judging team,” continued Kaitlyn Steben, Ag instructor.